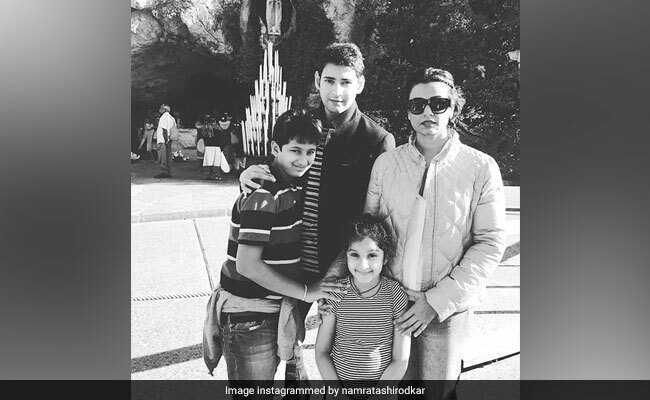 Namrata Shirodkar captioned the photo "Throwback"
Mahesh Babu completed 39 years in Telugu Film Industry today and to celebrate this feat, his wife Namrata Shirodkar shared a throwback picture, a still from the actor's very old film. On Thursday, Namrata Shirodkar shared a still from his film in which he featured as a child artiste. In the picture, Mahesh Babu can be seen standing next to his co-actor and his real life father actor Krishna. Namrata did not mention the name of the film but captioned the photo as: "Throwback". Mahesh Babu made his Telugu film debut as a child artiste in Needa. His first appearance as a leading actor was in 1999 film Raja Kumarudu, which also featured Preity Zinta. Namrata Shirodkar often delights fans with million dollar photos from her family vacations and get-togethers. Recently, Namrata accompanied Mahesh Babu to New York, where the actor was shooting for his upcoming film Maharishi. The couple's six-year-old daughter Sitara and 11-year-old son Gautham Ghattamaneni also accompanied them to the US where they had a gala time together. Namrata often updated fans with photos and videos from their New York vacation on Instagram. @urstrulymahesh After an amazing show of my all time favorite Broadway Classic, The Lion King... a perfect amalgamation of multilayered talent... a groupie with Rafiki was a must with the kids ... an evening well spent !! Mahesh Babu was last seen in critically acclaimed film Bharat Ane Nenu, which is directed by Vamshi Paidipally. The film also features Mohenjo Daro actress Pooja Hegde. Mahesh Babu and Namrata Shirodkar co-starred in 2000 film Vamsi and they fell in love while filming. Namrata married Mahesh Babu in 2005. Namrata, a former Miss India, quit films after getting married.